Interested in exploring the development of an employment social enterprise idea? This fall, TEF will host an ESE Idea Accelerator, a program that will support individuals and organizations developing early-stage employment social enterprise ideas. The accelerator will provide four experiential workshops, which will occur in October and November. Workshops will support participants to strengthen both business and social aspects of their ESE idea. The Accelerator will culminate in a pitch competition on the evening of December 11, 2018, during which participants will have the chance to pitch for $5,000 to $10,000 ‘Catalyzing Grant’ to conduct a feasibility study and develop a business plan for their ESE idea. The program will offer participants the chance to strengthen their ESE ideas through four interactive workshops. Workshop 3 – Financial Projections: During this workshop, you’ll gain an introduction to financial planning, including developing an initial budget for your employment social enterprise idea. Workshop 4 – Operational Plan: During this workshop, you’ll develop a high-level operational plan, and learn about key aspects of building a great team, advisory board, and operational plan. 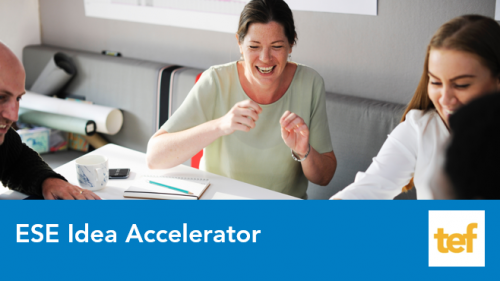 Individuals and organizations in Peel, Toronto and York Region with an interest in exploring employment social enterprise development are eligible to participate in the Accelerator program. You must be able to attend all four workshops of the Accelerator, in-person. Each workshop will be hosted at United Way Greater Toronto, 26 Wellington St. E in Toronto. Accelerator Information Session: Thursday, September 20, 2018 from noon – 1:00 p.m. Register now. Accelerator Applications Close: Thursday, September 27, 5:00 p.m.
Workshop 1: Tuesday, October 9, 2:00 p.m. – 5:00 p.m.
Workshop 2: Friday, October 19, 9:30 p.m. – 12:30 p.m.
Workshop 3: Tuesday, October 23, 2:00 p.m. – 5:00 p.m.
Workshop 4: Tuesday, November 13, 2:00 p.m. – 5:00 p.m. Accelerator Pitch Competition: Tuesday, December 11, 6:00 p.m. – 9:00 p.m. Please apply to participate in the ESE Idea Accelerator here.